Aluminum Titan Yacht lifts and installations in the Florida Keys and South Florida. For your large yacht call today for free estimate. 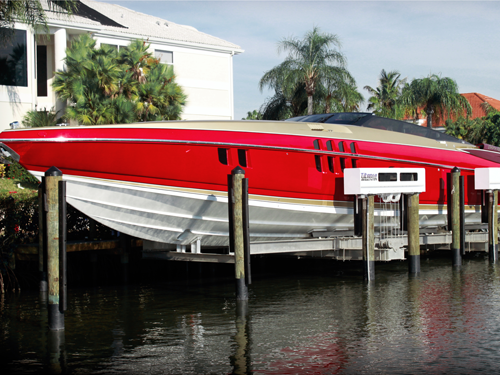 The ultimate boat lift on the market. Our TITAN line of luxury yacht boat lifts sets a new standard for performance, safety, and reliability to lift even the largest of yachts. Introduced in 2010, these lifts all use cycloidal drives, which are the most efficient drives in the industry, thereby maximizing output torque and lift speeds. This “Best of the Best” boat lift design has completely custom engineered bunk and cradle systems to fit your yacht. The TITAN comes standard with all the bells and whistles. So when only the absolute best will do, the IMM Quality Titan is the only choice. Take a look at our design and see why IQ boat lifts are Built for a Lifetime. 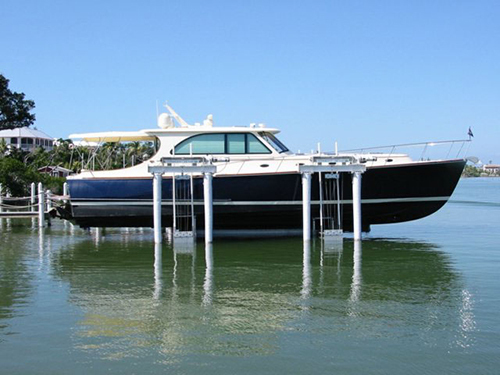 Please call Boat Lifts of South Florida today to discuss your luxury yacht boat lift needs. The Titan Yacht lift is a fully custom boat lift that can be engineered to accommodate even the largest yachts on the market. We can provide more information on request.